Choi Ji-man hits another game-winning homerun. September. 14, 2018 07:22. by Bo-Mi Im bom@donga.com. 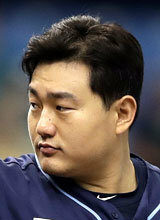 Choi Ji-man (age 27) is stealing the attention of Tampa Bay fans with his home run ceremony day after day. At the home game with the Cleveland Indians on Wednesday (local time), the South Korean player was designated as the fourth hitter and achieved a two-run home run from Carlos Carrasco, the opposing team’s ace player, and led his team’s victory by three to one. On the same day, Choi jumped on a first-pitch two-seamer by starter Carrasco and drove it over the center field wall. It was an additional two-run home run even before his fist overwhelming game-ending two-run home run passed off. ESPN assessed that although his overall talent is not dominant, Choi has outstanding power. He will be able to grow into a more productive hitter once he acquires ample opportunity to be at bat. In particular, ESPN eval‎uated that the American league (where there are designated hitters) suits Choi more. Naturally, Choi’s position for the next season is also gaining attention. After acquiring qualifications for the Minor League free agent (FA) in 2016, he has been signing split contracts (different annual pay according to the player’s position such as Major League or Minor League) every year. He could not really gain a good opportunity for three teams (Los Angeles Angels, New York Yankees, and Milwaukee Brewers) as his lacked defense compared to his potential hits. Would Choi, who clearly enhanced his presence at the Tampa Bay, be able to win the hearts of the team's front until the end of the season?